Microsoft Internet Explorer 6 (IE6) is the sixth major revision of Internet Explorer, a web browser developed by Microsoft for Windows operating systems. It was released on August 27, 2001, shortly after the completion of Windows XP. It is the default browser shipped with Windows XP and Windows Server 2003, and was also made available for Windows NT 4.0, Windows 98, Windows 2000, and Windows ME. IE6 SP1 is the last version of Internet Explorer available for Windows NT 4.0, Windows 98, Windows 2000, and Windows ME. IE6 SP2+ and IE7 were only included (IE6 SP2+) in or available (IE7) for Windows XP SP2+. Despite dominating market share (attaining a peak of 80% in mid-2004), this version of Internet Explorer has been widely criticized for its security issues and lack of support for modern web standards, making frequent appearances in "worst tech products of all time" lists, with PC World labeling it "the least secure software on the planet." In 2004, Mozilla finalised Firefox to rival IE6, and it became highly popular and acclaimed for its security, add-ons, speed and other modern features such as tabbed browsing. Microsoft planned to fix these issues in Internet Explorer 7 by June–August 2005, but it was delayed until an October 2006 release, over 5 years after IE6 debuted. Because a substantial percentage of the web audience still used the outdated browser (especially in China), campaigns were established in the late-2000s to encourage users to upgrade to newer versions of Internet Explorer or switch to different browsers. Some websites dropped support for IE6 entirely, most notable of which was Google dropping support in some of its services in March 2010. According to Microsoft's modern.ie website, as of August 2015[update], 3.1% of users in China and less than 1% in other countries are using IE6. 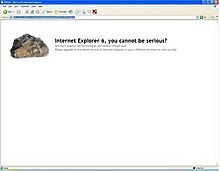 Internet Explorer 6 is the last version to be called Microsoft Internet Explorer before being rebranded as Windows Internet Explorer from Internet Explorer 7 onward. When IE6 was released, it included a number of enhancements over its predecessor, Internet Explorer 5. It and its layout engine Trident are required for many programs including Microsoft Encarta. IE6 improved support for Cascading Style Sheets, adding a number of properties that previously had not been implemented and fixing bugs such as the Internet Explorer box model bug. In Windows XP, IE6 introduced a redesigned interface based on the operating system's default theme, Luna. In addition, IE6 added DHTML enhancements, content restricted inline frames, and partial support of DOM level 1 and SMIL 2.0. The MSXML engine was also updated to version 3.0. Other new features included a new version of the Internet Explorer Administration Kit (IEAK) which introduced IExpress, a utility to create self-extracting INF-based installation packages, Media bar, Windows Messenger integration, fault collection, automatic image resizing, and P3P. Meanwhile, in 2002, the Gopher protocol was disabled. IE6 was the most widely used web browser during its tenure, surpassing Internet Explorer 5.x. At its peak in 2002 and 2003, IE6 attained a total market share of nearly 90%, with all versions of IE combined reaching 95%. There was little change in IE's market share for several years until Mozilla Firefox was released and gradually began to gain popularity. Microsoft subsequently resumed development of Internet Explorer and released Internet Explorer 7, further reducing the number of IE6 users. In a May 7, 2003 Microsoft online chat, Brian Countryman, Internet Explorer Program Manager, declared that Internet Explorer would cease to be distributed separately from Windows (IE6 would be the last standalone version); it would, however, be continued as a part of the evolution of Windows, with updates coming only bundled in Windows upgrades. Thus, Internet Explorer and Windows itself would be kept more in sync. However, after one release in this fashion (IE6 SP2 in Windows XP SP2, in August 2004), Microsoft changed its plan and released Internet Explorer 7 for Windows XP SP2 and Windows Server 2003 SP1 in late 2006. Microsoft Internet Explorer 6 was the last version of Internet Explorer to have "Microsoft" in the title: later versions changed branding to "Windows Internet Explorer", as a reaction to the findings of anti-competitive tying of Internet Explorer and Windows raised in United States v. Microsoft and the European Union Microsoft competition case. On March 4, 2011, Microsoft urged web users to stop using IE6 in favor of newer versions of Internet Explorer. They launched a website called IE6 Countdown, which would show how much percentage of the world uses IE6 and aim to get people to upgrade. The security advisory site Secunia reported 24 unpatched vulnerabilities in Internet Explorer 6 as of February 9, 2010. These vulnerabilities, which include several "moderately critical" ratings, amount to 17% of the total 144 security risks listed on the website as of February 11, 2010. As of June 23, 2006, Secunia counted 20 unpatched security flaws for Internet Explorer 6, many more and older than for any other browser, even in each individual criticality-level, although some of these flaws only affect Internet Explorer when running on certain versions of Windows or when running in conjunction with certain other applications. On June 23, 2004, an attacker used two previously undiscovered security holes in Internet Explorer to insert spam-sending software on an unknown number of end-user computers. This malware became known as Download.ject and caused users to infect their computers with a back door and key logger merely by viewing a web page. Infected sites included several financial sites. Probably the biggest generic security failing of Internet Explorer (and other web browsers too) is the fact that it runs with the same level of access as the logged in user, rather than adopting the principle of least user access. Consequently, any malware executing in the Internet Explorer process via a security vulnerability (e.g. Download.ject in the example above) has the same level of access as the user, something that has particular relevance when that user is an Administrator. Tools such as DropMyRights are able to address this issue by restricting the security token of the Internet Explorer process to that of a limited user. However this added level of security is not installed or available by default, and does not offer a simple way to elevate privileges ad hoc when required (for example to access Microsoft Update). Manion later clarified that most of these concerns were addressed in 2004 with the release of Windows XP Service Pack 2, and other browsers had begun to suffer the same vulnerabilities he identified in the above CERT report. In response to a belief that Internet Explorer's frequency of exploitation is due in part to its ubiquity, since its market dominance made it the most obvious target, David Wheeler argues that this is not the full story. He notes that Apache HTTP Server had a much larger market share than Microsoft IIS, yet Apache traditionally had fewer security vulnerabilities at the time. As a result of its issues, some security experts, including Bruce Schneier in 2004, recommended that users stop using Internet Explorer for normal browsing, and switch to a different browser instead. Several notable technology columnists suggested the same idea, including The Wall Street Journal's Walt Mossberg and eWeek's Steven Vaughan-Nichols. On July 6, 2004, US-CERT released an exploit report in which the last of seven workarounds was to use a different browser, especially when visiting untrusted sites. Microsoft Edge excluded from the list. Other sources show lower numbers. Internet Explorer 6 was the most widely used web browser during its tenure (surpassing Internet Explorer 5.x), attaining a peak percentage in usage share during 2002 and 2003 in the high 80s[contradictory], and together with other versions up to 95%. It only slowly declined up to 2007, when it lost about half its market share to Internet Explorer 7 and Mozilla Firefox between late 2006 to 2008. IE6 remained more popular than its successor in business use for more than a year after IE7 came out. A 2008 DailyTech article noted, "A Survey found 55.2% of companies still use IE 6 as of December 2007", while "IE 7 only has a 23.4 percent adoption rate". Net Applications estimated IE6 market share at almost 39% for September 2008. According to the same source, IE7 users migrate faster to IE8 than users of its predecessor IE6 did, leading to IE6 once again becoming the most widely used browser during the summer and fall of 2009, eight years after its introduction. As of February 2010, estimates of IE6's global market share ranged from 10-20%. Nonetheless, IE6 continued to maintain a plurality or even majority presence in the browser market of certain countries, notably China and South Korea. Google Apps and YouTube dropped support for IE6 in March 2010, followed by Facebook chat in September. On January 3, 2012, Microsoft announced that usage of IE6 in the United States had dropped below 1%. In August 2012, IE6 was still the most popular IE web browser in China. It was also the second most used browser overall with a total market share of 22.41%, just behind the Chinese-made 360 Secure Browser at 26.96%. In July 2013, Net Applications reported the global market share of IE6 amongst all Internet Explorer browsers to be 10.9%. As of August 2015, IE6 was being used by <1% users in most countries, with the only exception being China (3.1%). As of December 2015, IE6 was being used by <1% users in all countries where data is available including China and South Korea. A common criticism of Internet Explorer is of the speed at which fixes are released after discovery of the security problems. Microsoft attributes the perceived delays to rigorous testing. A posting to the Internet Explorer team blog on August 17, 2004 explained that there are, at minimum, 234 distinct releases of Internet Explorer that Microsoft supports (covering more than two dozen languages, and several different revisions of the operating system and browser level for each language), and that every combination is tested before a patch is released. In May 2006, PC World rated Internet Explorer 6 the eighth worst tech product of all time. A certain degree of complacency has been alleged against Microsoft over IE6. With near 90% of the browser market the motive for innovation was not strongly present, resulting in the 5 year time between IE6's introduction and its replacement with IE7. This was a contributing factor for the rapid rise of the free software alternative Mozilla Firefox. Unlike most other modern browsers, IE6 does not fully nor properly support CSS version 2, which made it difficult for web developers to ensure compatibility with the browser without degrading the experience for users of more advanced browsers. Developers often resorted to strategies such as CSS hacks, conditional comments, or other forms of browser sniffing to make their websites work in IE6. Additionally, IE6 lacks support for alpha transparency in PNG images, replacing transparent pixels with a solid colour background (grey unless defined in a PNG bKGD chunk). There is a workaround by way of Microsoft's proprietary AlphaImageLoader, but it is more complicated and not wholly comparable in function. The user could crash the browser with a single line of code in the address bar, causing a pointer overflow. Nvidia's website displaying a message encouraging Internet Explorer 6 users to upgrade to a newer browser. In July 2008, 37signals announced it would phase out support for IE6 beginning in October 2008. In February 2009, some Norwegian sites began hosting campaigns with the same aim. In March 2009, a Danish anti-IE6 campaign was launched. In January 2010, the German Government, and subsequently the French Government each advised their citizens to move away from IE6. Also in January 2010, Google announced it would no longer support IE6. In February 2010, British citizens began to petition their government to stop using IE6, though this was rejected in July 2010. In March 2010, in agreement with the EU, Microsoft began prompting users of Internet Explorer 6 in the EU with a ballot screen in which they are presented with a list of browsers in random order to select and upgrade to. The website is located at BrowserChoice.eu. In May 2010, Microsoft's Australian division launched a campaign which compared IE6 to 9-year-old milk and urged users to upgrade to IE8. With the increasing lack of compatibility with modern web standards, popular websites began removing support for IE6 in 2010, including YouTube and their parent company Google; however large IT company support teams and other employers forcing staff to use IE6 for compatibility reasons slowed upgrades. Microsoft themselves eventually began their own campaign to encourage users to stop using IE6, though stating that they would support IE6 until Windows XP SP3 (including embedded versions) support is removed. However, on January 12, 2016 when the new Microsoft Lifecycle Support policy for Internet Explorer went into effect, IE6 support on all Windows versions ended, more than 14 years after its original release, making the January 2016 security update for multiple versions of XP Embedded the last that Microsoft publicly issued for IE6. Internet Explorer uses a zone-based security framework, which means that sites are grouped based upon certain conditions. IE allows the restriction of broad areas of functionality, and also allows specific functions to be restricted. The administration of Internet Explorer is accomplished through the Internet Properties control panel. This utility also administers the Internet Explorer framework as it is implemented by other applications. Internet Explorer 6 dropped Compatibility Mode, which allowed Internet Explorer 4 to be run side by side with 5.x. Instead, IE6 introduced quirks mode, which causes it to emulate many behaviors of IE 5.5. Rather than being activated by the user, quirks mode is automatically and silently activated when viewing web pages that contain an old, invalid or no DOCTYPE. This feature was later added to all other major browsers to maximize compatibility with old or poorly-coded web pages. Internet Explorer 6.0 supports Windows NT 4.0 (Service Pack 6a only), Windows 98, Windows Me, Windows 2000, Windows XP and Windows Server 2003. The Service Pack 1 update supports all of these versions, but Security Version 1 is only available as part of Windows XP Service Pack 2 and Windows Server 2003 Service Pack 1 and later service packs for those versions. Versions after Windows XP include Internet Explorer 7 and higher only. ^ "XPSP2 and its slightly updated user agent string". The Windows Internet Explorer Weblog. Microsoft via MSDN. 2004-09-02. Retrieved 2008-10-05. ^ a b Tynan, Dan (2005-05-26). "The 25 Worst Tech Products of All Time". PC World. IDG. Archived from the original on 15 June 2006. Retrieved 2006-07-18. ^ a b Goss, Patrick (2009-07-14). "Official: YouTube to stop IE6 support". TechRadar. Future plc. Retrieved 2009-07-26. ^ a b Krazit, Tom (2010-01-30). "Google phasing out support for IE6". CNET. CBS Interactive. Retrieved 2010-01-30. ^ a b "IE 6 Countdown". ^ "CSS Enhancements in Internet Explorer 6". CSS Enhancements in Internet Explorer 6. Microsoft. September 2006. Archived from the original on 2010-10-28. Retrieved 2010-02-09. ^ "SMIL Standards and Microsoft Internet Explorer 6, 7, and 8". axistive. June 28, 2007. Archived from the original on June 3, 2007. Retrieved 2007-05-27. ^ Kaiser, Cameron (21 July 2009). "Using a web browser to access gopher space". Floodgap. Retrieved 2007-05-11. ^ Hansen, Evan; Staff Writer (May 31, 2003). "Microsoft to abandon standalone IE". CNET. CNET. Archived from the original on 9 August 2012. Retrieved 10 April 2016. ^ "Internet Explorer 6 Countdown". ^ a b "Vulnerability Report: Microsoft Internet Explorer 6.x". Secunia. Retrieved 9 February 2010. ^ Lemos, Robert (25 June 2004). "Researchers warn of infectious Web sites". ZDnet. CBS Interactive. Retrieved 8 September 2010. ^ "Vulnerability Note VU#713878". US-CERT. June 9, 2004. Retrieved 2006-04-07. ^ Manion, Art (July 7, 2005). "Perspective: A safe browser? No longer in the lexicon". CNET. CBS Interactive. Retrieved 2006-04-07. ^ Wheeler, David (November 14, 2005). "Why Open Source Software / Free Software (OSS/FS, FLOSS, or FOSS)? Look at the Numbers!". Retrieved 2010-02-09. ^ Schneier, Bruce (December 12, 2004). "Safe Personal Computing". Retrieved 2006-04-07. ^ Mossberg, Walt (September 16, 2004). "How to Protect Yourself From Vandals, Viruses If You Use Windows". The Wall Street Journal. Dow Jones & Company. Retrieved 2006-04-07. ^ Vaughan-Nichols, Steven (June 28, 2004). "Internet Explorer Is Too Dangerous to Keep Using". eWeek. Linux & Open Source – Opinions. Retrieved 2006-04-07. ^ "Browser Version Market Share". Net Applications. March 2019. Retrieved 2017-12-02. ^ a b Mick, Jason (2008-04-03). "Firefox Makes Big Gains In Business at IE's Expense". DailyTech. Archived from the original on 2009-08-15. Retrieved 2008-10-05. ^ "Top Browser Share Trend – Market Share". Net Applications. September 2008. Retrieved 2008-10-05. The date range spans October, 2006—September, 2008. ^ "Top Browser Share Trend". Hitslink. February 9, 2010. Retrieved 9 February 2010. ^ "Global Web Stats". W3Counter. February 2010. Retrieved 2010-03-20. ^ "StatCounter Global Stats". StatCounter. February 2010. Retrieved 2010-03-20. ^ "Browser Version Market Share". Net Applications. February 2010. Retrieved 2010-03-20. ^ "Top 12 Browser Versions in China". StatCounter. February 2010. Retrieved 20 March 2010. ^ "Top 12 Browser Versions in South Korea". StatCounter. February 2010. Retrieved 20 March 2010. ^ "Korea Paying Price for Microsoft Monoculture". The Korea Times. September 23, 2009. ^ "Modern browsers for modern applications". Google. January 2010. Retrieved 5 March 2011. ^ Protalinski, Emil (February 2010). "YouTube to kill IE6 support on March 13". Ars Technica. Condé Nast. Retrieved 5 March 2011. ^ Schmidt, Rodrigo (August 2010). "Chat with No Interruptions". Facebook. Retrieved 26 August 2010. ^ "IE6 Usage Drops Below 1 Percent in U.S." PC Magazine. Retrieved 2012-01-04. ^ Keizer, Gregg (2013-07-03). "IE10 pushes past predecessor to take second place among Microsoft's browsers". Computerworld. IDG. Retrieved 2013-07-03. ^ "StatCounter Global Stats". StatCounter. December 2015. Retrieved 2018-06-16. ^ "The Basics of the IE Testing Matrix". Internet Explorer team blog. Microsoft. August 17, 2004. Retrieved 2006-04-07. ^ "PNG Files Do Not Show Transparency in Internet Explorer". Microsoft Help and Support. Microsoft. July 19, 2007. ^ Yam, Marcus (February 4, 2010). "How to Make Internet Explorer 6 Crash Instantly". Tom's Hardware. Purch. Retrieved 25 January 2011. ^ "Another Way to Ditch IE6". Krebs on Security. February 3, 2010. Retrieved 25 January 2011. ^ "Phasing out support for IE 6 across all 37signals products". 37signals. July 3, 2008. Retrieved 11 June 2010. ^ Calore, Michael (February 19, 2009). "Norwegian Websites Declare War on IE 6". Wired. Condé Nast. Retrieved 9 February 2010. ^ Nielsen, Jens (27 March 2009). "Danske medier lover død over Internet Explorer 6". Comon (in Danish). Computerworld A/S. Retrieved 9 February 2010. ^ Fildes, Jonathan (18 January 2010). "France joins Germany warning against Internet Explorer". BBC Online. BBC. Retrieved 9 February 2010. ^ "Google phases out support for IE6". BBC Online. BBC. 30 January 2010. Retrieved 9 February 2010. ^ "Pressure mounts to phase out Internet Explorer 6". BBC Online. BBC. 2 February 2010. Retrieved 9 February 2010. ^ "Petition Response". hmg.gov.uk. HMG. 31 July 2010. Archived from the original on 2 August 2010. Retrieved 9 February 2010. ^ Currie, Brenton (2010-03-04). "Microsoft's European browser ballot now live, Opera benefiting". Digital Journal. Retrieved 2010-03-06. ^ "Upgrade to Internet Explorer 8". Microsoft. Archived from the original on May 18, 2010. ^ Metz, Cade (2009-07-08). "Orange UK exiles Firefox from call centres". The Register. Situation Publishing Ltd. Retrieved 2009-07-26. ^ "IE6 Countdown". Microsoft. 2011-03-05. Archived from the original on 2011-03-04. Retrieved 2011-03-05. ^ Shiels, Maggie (2009-08-13). "Microsoft backs long life for IE6". BBC Online. BBC. Retrieved 2009-08-21. ^ "Internet Explorer Support Lifecycle Policy FAQ". Microsoft Lifecycle Support Website. Retrieved 2015-12-30. ^ "Cumulative Security Update for Internet Explorer 6 for WEPOS and POSReady 2009 (KB3124275)". 2016-01-12. Retrieved 2016-01-12. ^ "How to install and use Compatibility mode in Internet Explorer 5 or 5.5 (KB197311)". Microsoft Help and Support. Microsoft. 2007-01-23. Retrieved 2008-10-05. ^ "Unable to Use Internet Explorer 4.0 Compatibility Mode (KB237787)". Microsoft Help and Support. Microsoft. 2007-01-24. Retrieved 2008-10-05. ^ Hardmeier, Sandi (2005-08-25). "The History of Internet Explorer". Internet Explorer Community. Microsoft. Retrieved 2008-10-05. ^ Chao, Ingo; Holly Bergevin; Bruno Fassino; John Gallant; Georg Sørtun; Philippe Wittenbergh (June 3, 2006). "Quirks mode in IE 6 and IE 7". satzansatz.de. Archived from the original on May 31, 2017. Retrieved October 5, 2008. ^ Koch, Peter-Paul. "Quirks Mode and Strict Mode". QuirksMode.org. Retrieved 2010-02-09. ^ "Internet Explorer 6 SP1 System Requirements". Microsoft. 27 August 2001. Archived from the original on 19 November 2010. "Microsoft Windows Family Home Page". Windows History: Internet Explorer History. Archived from the original on 2003-10-02. "Microsoft Knowledge Base". How to determine which version of Internet Explorer is installed. "Index DOT Html and Index DOT Css". Browser History: Windows Internet Explorer.